If there’s one thing I hate, it’s shopkeepers scamming their customers. 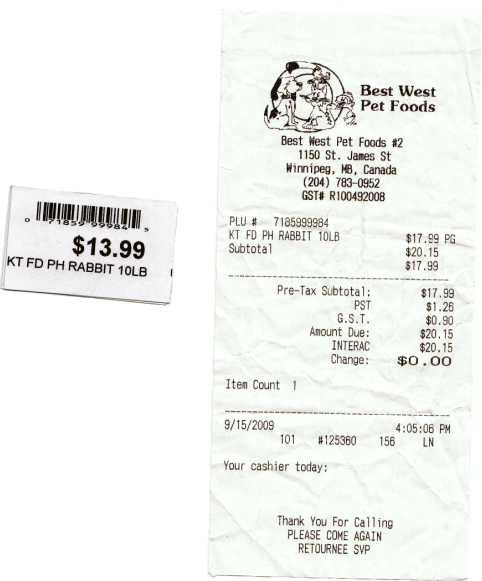 Yesterday I stopped by a local Best West Pet Foods store to pick up some rabbit food. They had about three or four different kinds/sizes, so I compared them all for price and quality, then picked a 10 lb bag of Kaytee Forti-Diet ProHealth rabbit food. The price on the shelf under the bags of food said it was $13.99, but when I got the stuff rung up at the counter, the total was over $20 after taxes. That didn’t sound right, so I asked the cashier to double check the price, and she responded that the price was $17.99. I told her I thought the tag on the shelf said $13.99, so I went back to check. Sure enough, the shelf said it was the lesser of the two prices. As it happened, another employee — who looked like she might be the manager, so that’s what I’ll call her from now on — came around and the cashier explained the issue. The first thing she said was that the sticker on the bag was the correct price. I hadn’t noticed any price tag sticker on the bag, but after some searching, I managed to find it, and it did have the higher price. I went with the manager to check out the shelf tag again. She took it out, look at it, looked at the bags on the shelf, then told me the tag was for a different brand. I pointed out the product code says “KT”, which I guessed could mean “Kaytee” brand. She explicitly said no, it was a different brand. Then I posted out the “FD” could mean “Forti-Diet”, and “PH” could mean ProHealth. She consistenly refused to admit the tag was for the very bag of rabbit food I picked up as she looked back and forth between the tag and the bag. After a bit, I insisted that this was the tag for the very item I was buying, but she denied it again. After she decided she had investigated enough, she put the tag with the incorrect price back on the shelf under the items she insisted were a higher price! I told her not to do that because the price was wrong. She replied that it was probably for something that was out of stock at the moment. The shelves were all completely full and it was clear that nothing was out of stock. I mumbled “[t]hen I guess I know never to shop here again” just loud enough for her to hear as the left to return to the back room, then returned to the cashier in disgust at her behavior. Upon reaching the cashier counter, I noticed that the bag of food I had picked had been pierced and taped over with clear tape. I asked the cashier if it was okay to grab another bag instead and she said “yes”. Seizing the opportunity, I also liberated the errant shelf tag as well so as to prevent any future customers from being tricked into buying higher priced food. Incorrect shelf tags on items in stores really pisses me off. But what really makes me angry is shopkeepers actively condoning the practice. It’s not always easy to catch this sort of thing when you are buying multiple items.